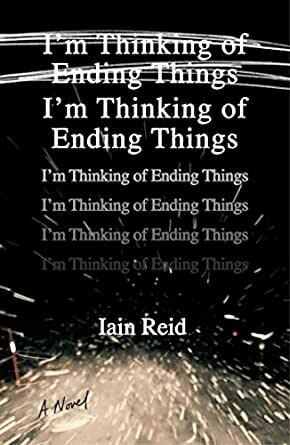 "I'm Thinking of Ending Things is an ingeniously twisted nightmare road trip through the fragile psyches of two young lovers. My kind of fun!" --Charlie Kaufman, Academy Award winning writer and executive producer of "Eternal Sunshine of the Spotless Mind"
5.0 de 5 estrellas100% suspenso! Muy bueno! Creo que tarde dos noches en terminarlo. Me mantuvo siempre cuestionándolo todo, tratando de descubrir siempre que podría ser el desenlace. I cannot believe this was so highly reviewed. It is not really a noir novel it's really a (trite) essay on various dualities -- alone vs not alone, good vs bad, who's knowable or not. Dialogue explorations and internal musings on these topics are predictable and not provocative. The story itself -- not a surprise and anyway I didn't care about a single character. There is no point in trying to explain a book like this. Books like this continue to exist after that last page is turned... Because books like this need to be experienced. Felt. Endured. Books like this haunt you. And the best thing about this book: It’s designed to be re-read — and re-experienced — once it’s finished. That ending redefines the book, the plot, the characters... it shifts your experience. And it makes yo go back and re-look at everything from a new perspective. UPDATE: The book takes on a whole new tone in its second reading. Genius in its execution — all the clues are on every page. It is impossible to review the content of this book because anything said would be a spoiler. There is an excellent piece of advice given in the story that is a key to understanding everything. It is only one sentence. To reveal that would be a spoiler. So, what CAN be said? This is truly a suspenseful psychological thriller with an almost unpredictable ending. For the few who might anticipate the ending, the motive, the "why," remains unpredictable. Ultimately, reader or listener agreement with the ending will determine if the ending was satisfactory. Many reviewers were critical of the ending. It is a great story by Iain Reid. Candace Thaxton brought this to life with excellent narration and voice quality. There is another narrator, male, last name not clear, who contributed vital information. His voice was also perfect for this story. There were several great technical parts to the audio but, much as with content, to list them would be spoilers. A great five-star performance on the part of all. I will look for more by these artists. So bad. Undergrad level philosophizing mixed with a boring, draggy plot that feels torn from generic horror movies. Super obvious the author had no idea where he was going after a certain point. Found myself wondering if this was fanfic or a self-published first draft or something - but apparently, no, it was a bestseller in Canada. A marketing trick if there ever was one. A great premise extremely lazily executed. Who are Iain Reid's parents? Are they famous? Why was this published by anyone at all? I rarely read a book I don’t like but this one was, eh...wasted hours. The author tried too hard to be inside the characters head and creating that “Psycho” feel, but failed miserably. I assume the author intended to leave you scratching your head and disturbed but instead left me saying, “you’re kidding me, right?” Maybe my expectations were too high, but I really hoped this would be a good horror/psychological thriller. I, personally, wasn’t a fan.